As I write this post, I’m home from work trying to nurse a cold that’s been lingering for the past few days. I almost felt guilty staying home today to try to feel better, but then I thought “Why do I feel this intense pressure to be at work, even when I’m not healthy or up to being there?” I think a lot of it has to do with the societal pressure of feeling like work should always come first. I shouldn’t have to be on my death bed to justify taking a sick day when I clearly can’t function as I normally could if I was there. After reading a few of Anne’s posts on her blog, Balanced Living, I’m reminded by how important it is to manage stress within one’s life. The post, Mind over Medicine has a link to an interesting TED talk about stress and how to deal with it. Stress is probably what caused me to be sick in the first place. Now, its’ time to heal with some healthy food and much needed rest. 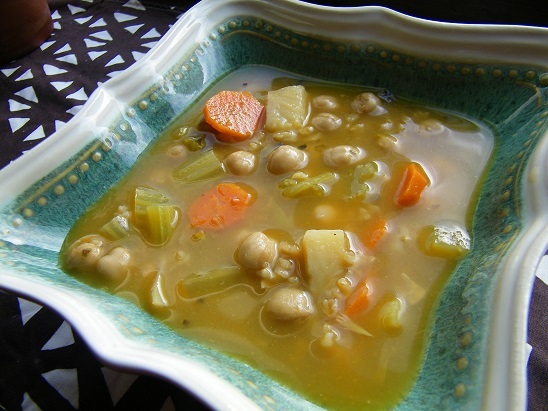 The chickpea and wild rice soup recipe posted below, is filling, nourishing, and delicious. It is just what my body ordered on a day like today. Heat the olive oil in a large pot. When it’s hot, add the onion. After letting the onion soften for 3-5 minutes, add the garlic. After a minute or so, add the potato, carrots, and celery. 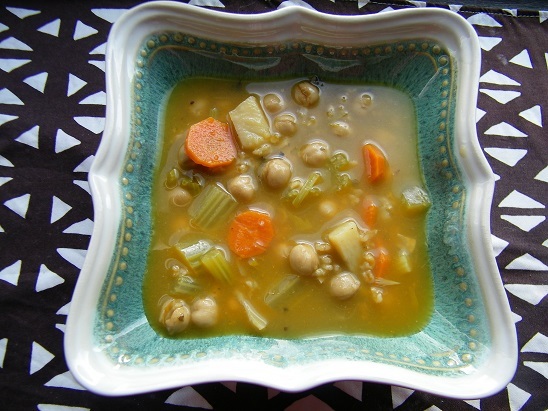 Let those ingredients cook for about 5 minutes before adding the chickpeas, vegetable broth, rice, and spices. Bring the soup to a boil over medium-high heat. Then let it cook for 20-25 minutes or until the rice and potatoes are tender. Enjoy! I only want soup when I’m sick. This may be worth making when i’m well! I agree – soup is perfect for sick days, but in this case I think the cold weather is enough of an excuse to make it again soon! Mmmmmmmmmmmm,….this looks divine & very appetizing too. Thank you! It was very soothing as well as delicious. I saw your recipe for lemon and lavender tea – that’ll be a recipe I save! Thank you for making it and for the feedback! 🙂 I must get myself into the kitchen to try more recipes like you do!